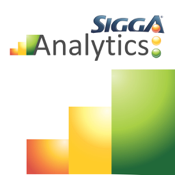 SIGGA Analytics makes an overall intelligent management of your equipment’s health. This app provides clear and objective information on the assets performance, allowing maintenance managers to make decisions that lead to reduced costs and increased productivity. The system analyzes each asset over many angles of maintenance, generating a spectacular view of its conditions and helping the manager with guidance on what and when to make an intervention. - Works seamlessly both on-line and off-line. Please, keep in touch to receive additional information.